Sheriff John B. Spears reports a fatal hunting accident that occurred on Pisgah Road East of State Highway 131 in the Town of Whitestown. At approximately 7:30 A.M. two males age 17 and 15 were going hunting on private land off Pisgah Rd. While exiting their vehicle and preparing for the hunt there was an accidental discharge of a 22 caliber pistol. The 17 year old male was struck in the side/chest area. The 17 year old male was pronounced deceased by Vernon County Coroner Janet Reed on the scene. Assisting at the scene was the Ontario Fire Department, Ontario Ambulance Service, Tri State Med Link, Vernon County Coroner, and the Wisconsin Department of Natural Resources. The accident remains under investigation by the Wisconsin Department of Natural Resources. Update - On May 23, 20017 at about 4 p.m. Jon C. Cooley m/w age 75 of Bagley, was operating a Warco School Bus with 8 River Ridge students on board as passengers; a five-year-old male, two five-year-old females, a six-year-old female, an 8-year-old female, two 8-year-old males and a fifteen-year-old male. Cooley was traveling north across the CTH P from Morgan Rd to Borah Ridge Road in the Patch Grove Township. Randy Pugh age 59 of Viola, was traveling westbound in a 2002 Peterbuilt dump truck, owned by Lepke Trucking of Lacrosse, WI, on CTH P. As the school bus crossed the intersection with CTH P the dump truck came up over the hills from the east and was unable to stop. The right front door area of the school bus collided with the left cab area of the dump truck. The dump truck went into the north ditch area and came to a stop. The school bus spun around, traveled into the south ditch area, through a fence line, and came to rest in the pasture south of CTH P.
One child was ejected from the school bus. Six children and the bus driver were transported to area hospitals, Crossing Rivers in Prairie Du Chien and Grant Regional Health Care in Lancaster. Injuries range from minor to severe and some involved parties are still in the hospital today. Mr. Pugh was treated and released at the scene of the crash. 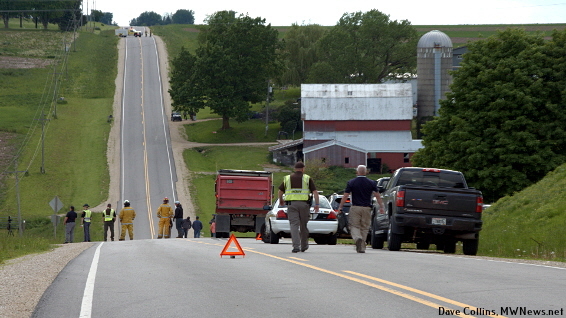 The following agencies assisted at the scene of the crash; Fennimore PD, Crawford Co SO, Bloomington Fire, Bagley First Responders, Cassville EMS, Fennimore EMS, Gunderson EMS, Lancaster EMS, Lancaster Fire, Patch Grove Fire, West Grant EMS, Grant County Emergency Government, River Ridge Schools, and the Wisconsin State Patrol. On May 25, 2017 at approximately 9:10 am the Grant County Sheriff’s Office received a report of a female subject that had jumped off of the Hwy 151 Iowa / Wisconsin Bridge, on the Wisconsin side in the Township of Jamestown. Several witnesses stated the female parked her vehicle on the bridge, took her jacket off, and then jumped over the concrete railing into the water below. Emergency personnel responded from land and water. A Grant County Deputy and a City of Dubuque Police Officer were able to descend a steep cliff and locate the female. She was approximately 20 feet from shore clinging onto a tree. Both officers removed their gear and were able to get halfway out to the female. They had a long branch and were able to get her to hold on as they pulled her to shore. Moments later East Dubuque and Dubuque Fire Departments arrived in their rescue boats. The female subject was transported, by boat to a nearby boat landing and then transported via East Dubuque EMS to a hospital in Dubuque for evaluation. There were no apparent injuries reported. The Grant County Sheriff’s Office was assisted by the Dubuque Police Department, Dubuque Fire Department, East Dubuque Police Department, East Dubuque Fire Department, and East Dubuque EMS. BNSF suspended rail traffic during the incident. While emergency personnel were resolving the above incident a two vehicle crash occurred on the bridge in front of officers. Scott Wiest, age 46 from Lancaster, was traveling southbound on Hwy 151 in his 2002 Silver Buick Lasabre. Jessica Welch, age 24 from Platteville, was traveling southbound in her 2008 GMC Acadia when she was rear ended by Wiest. There were no injuries and everyone was wearing their seatbelts. Wiest vehicle sustained front end damage and the Welch vehicle sustained rear end damage. Wiest will be cited for inattentive driving. The Grant County Sheriff’s Office would like to remind all motorists to move over and slow down when approaching emergency vehicles. Cassville, WI - May 23, 2017 - After an extensive investigation, on May 5, 2017, the Cassville Police Department along with members of the Grant County Sheriff’s Department executed a search warrant at the Steven G. Kirschbaum residence, 109 West Dewey Street in the Village. The nature of the warrant was to determine long term water meter tampering and theft from the Village of Cassville Water and sewer Department. Steven G. Kirschbaum was arrested for theft and water meter tampering. He was transported to the Grant County Jail in Lancaster. Steve Kirschbaum was a 38 year employee of the Village of Cassville Water and Sewer Department until his retirement in 2015. On Tuesday, May 30, 2017, at approximately 4:22 a.m., the Crawford County Sheriff’s Department received an emergency call regarding a traffic accident that occurred on STH 82 approximately one-half mile west of STH 35 in the Township of Freeman. Emergency responders arrived on scene, immediately closed the highway, and started working on extracting Walleser’s vehicle from the river. Milo’s Towing Service with the assistance of the La Crosse County Dive Team were able to extracted Walleser’s vehicle from the river. Walleser was located in the vehicle and pronounced dead at the scene. The vehicle had extensive front end damage. An autopsy will be performed today in Madison. The Crawford County Highway Department began the process of repairing the roadway shortly after the vehicle was removed from the scene. STH 82 will remain closed between STH 35 and Lansing until further notice. The second phase included bringing the victim and attacker to Crossing Rivers Hospital for triage training dealing with multiple wounded arriving at the same time. Clayton County Sheriff’s Office and Monona Police Department responded to a robbery complaint at Freedom Bank located at 106 Main Street Monona, IA. Information collected by the Clayton County Sheriff’s Office communications center advised one male subject had passed notes to a Freedom Bank employee demanding money and threatening to “blow up” the building should they not comply. The first responding officer, Sheriff Michael J. Tschirgi, located a subject outside Freedom Bank and took him into custody without incident. Twenty (20) year old Tyler Michael Koehler of Monona, IA was placed under arrest and transported to the Clayton County Jail. 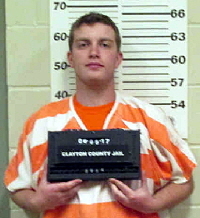 Koehler is being charged with Robbery 2nd Degree a Class C Felony. The Clayton County Sheriff’s Office was assisted by the Monona Police Dept. and several area law enforcement agencies. Prairie du Chien, WI - On June 9, 2017 at approximately 11:30pm a deputy with the Crawford County Sheriff’s Office located Todd F. Groom Jr., age 28, of Steuben, at the McDonald’s Restaurant in the City of Prairie du Chien. Groom was placed under arrest for active felony warrants through Grant and La Crosse counties. During a search of Groom’s pockets, ammunition was located. During a search of the vehicle Groom had been operating, a Mossberg .410 shotgun with a sawed off barrel and defaced serial number was located in the backseat. Groom is a convicted felon and therefore, is not to possess firearms. Groom is also on bond through La Crosse County for a prior firearm possession charge. Groom’s bond conditions through La Crosse County prohibit him from possessing firearms and ammunition. Groom is being referred to the District Attorney’s Office for operating a motor vehicle without the owner’s consent, operating after revocation, felon in possession of a firearm and felony bail jumping. This case remains under investigation, additional charges are pending. 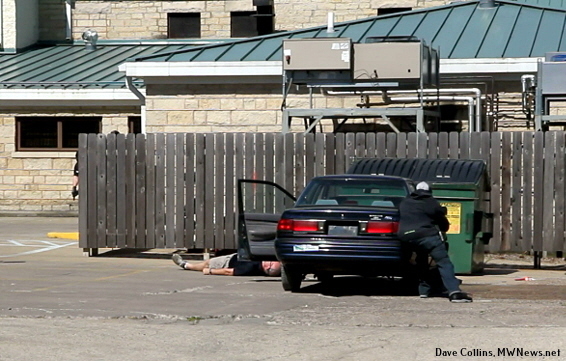 Assisting on scene was the Prairie du Chien Police Department. Update - Based on sources, it seems two of the girls were out of the car when emergency responders arrived on site. Clayton County, Iowa - On June 12, 2017 at 4 p.m. a 1999 Chev. Lumina driven by Amber C. Garlow, age 16 of Holy Cross, IA, was traveling west on Garber Road when she lost control, entered the south ditch, rolled, and the vehicle came to rest on its top in a field to the south. The car became engulfed in flames after the final rest. The driver and passengers; Emma D. Hefel, age 16; and Lilian M. Horstman, 15; both of Guttenberg, were transported to the Guttenberg Hospital. Two of the girl were wearing their seatbelts, Emma Hefel was not. Assisting at the scene: Clayton Co. Sheriff, Guttenberg EMS, Fire, and Ambulance. No other details are known at this time. Highway 60 along the Wisconsin River is a beautiful drive. In many places the road is only two lanes, so admiring the stunning river views, while keeping one's eyes on the winding road, takes some attention. One could be forgiven for not noticing small villages, such as Orion. These small villages have their history, and Orion punches above it's weight. It has a number of 'firsts' under its belt. It was the first village in Richland County to be platted (1846). Orion was the location of the first Richland County Court House (1850-1852). The Cedar Mound Cemetery is the oldest cemetery in Richland County, and the site of the first non-native American burial in Richland County. 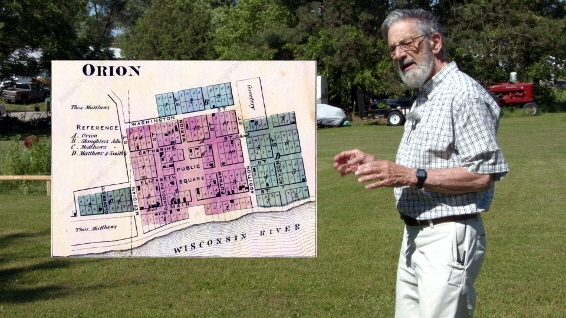 Bob Hirschy, Prof. of Biology, Emeritus, UW-Richland, lives in Orion and has become the local historian. Mr. Hirschy said that the village was established because it was a favorable site for a ferry over to what was to become Muscoda. The ferry operated from 1843 to 1868. Watch Video. 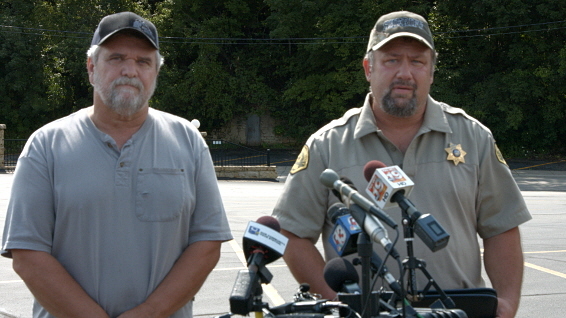 (Right) Raymond J. Otigham, 43 of Madison. Richland County, WI - June 26, 2017 - Deputies responded to a two vehicle crash on US Hwy 14 near Fairview Rd just after 4:30pm on Friday evening, June 23rd. Witnesses on scene informed law enforcement that the driver of one vehicle involved in the crash had walked out into a nearby cornfield on two separate occasions and was acting suspiciously. 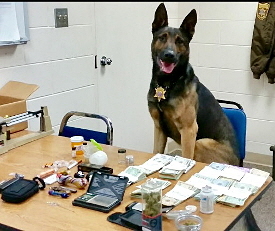 K9 Rambo was deployed for a search of the nearby area and located two containers filled with a substantial amount of marijuana. K9 Rambo also alerted to the odor of narcotics inside the suspect’s vehicle. Deputies searched the vehicle and numerous items of drug paraphernalia, prescription pills, and more substances containing THC were discovered. Also found in the vehicle was approximately $9,300.00 in cash linked to the distribution of illegal narcotics. The suspect, Raymond J. Otigham, 43 of Madison, was arrested and transported to the Richland County Jail. This case has been referred to the Richland County District Attorney for formal charges. Any information regarding suspicious activity or crimes of any kind can be reported to Richland County Crime Stoppers at 608-647-CLUE (2583). Grant County, WI - On 6/27/17 at about 4:15 a.m. David Olson age 61 of Houston, MN was traveling southbound on USH 61 in a semi tractor trailer. Lee Steinhorst age 33 of Wauzeka, WI was traveling northbound in a 2003 Dodge Caravan. About .2 miles south of Greenwood Rd. in Fennimore Township, Steinhorst's vehicle crossed the centerline into the southbound lane of traffic, colliding head-on with the tractor trailer being operated by Olson. The vehicles came to rest in the roadway. Lee Steinhorst was pronounced dead at the scene by the Grant County Coroner. Olson was not injured. The Grant County Sheriff's Office was assisted at the scene by Boscobel and Fennimore Police, Fennimore Fire and EMS and the Wisconsin State Patrol. The vehicles were removed by Doan's Auto Body of Fennimore and Kieler Service Center of Kieler. This crash remains under investigation. This is the 3rd fatal crash in Grant County in 2017. Grant County, WI - A teen was able to pull his mother to safety out of a burning vehicle following a rollover crash in Grant County Sunday morning June 25, 2017. At approximately 5:30am, the Grant County Sheriff’s Office received a 911 call of a vehicle that had rolled over on County Highway C at Millville Hollow Road in the Township of Millville. The driver of the vehicle, 42 year old Carrie Johnston of Prairie du Chien, lost control of the vehicle while negotiating a curve. Johnston and her son, 18 year old Jack Johnston, tried to exit the vehicle as it caught on fire and Jack pulled his mother, Carrie, out of the vehicle before it became totally engulfed in flames. Mount Hope Fire responded to the scene and extinguished the fire. Carrie Johnston was taken to Grant Regional Health Center in Lancaster for minor injuries. She was then arrested for OWI and Operating without a valid driver’s license. Assisting the Grant County Sheriff’s Office at the scene was the Mount Hope Fire Department, West Grant EMS, Bob’s Towing, and Scenic Rivers. 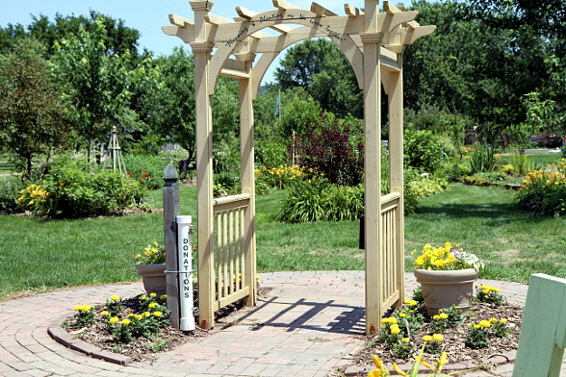 Prairie du Chien, WI - A tour of the gardens on St. Feriole Island over the 4th of July was a wonderful experience. 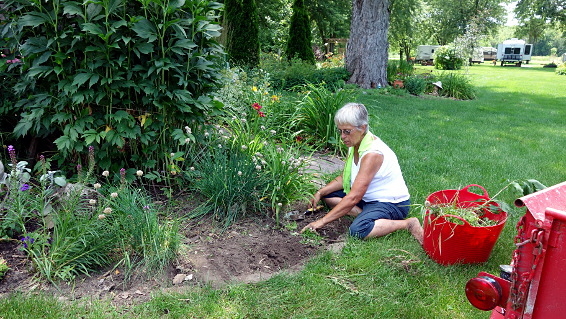 The work these master gardeners, and their helpers, do is a cut above. There are places to sit, eat and contemplate, or watch birds flutter in and out of beautifully colored bird houses. Midwest News shot a video of the gardens in 2015. Most of us want an immediate return for our efforts when working on a project. Few have the mindset to labor in a community effort that benefits our neighbors without any direct acknowledgment. There are about 12 to 15 special people who do just that, dedicating their time and effort to create a wonderful peaceful experience for the greater community without expectation of recognition. On July 9, 2017 at approximately 12:45am the Crawford County Communications Center received a report of a verbal altercation taking place at 16289 Shedivy Drive in the Township of Clayton. When a deputy arrived on scene, family members were outside of the residence and advised the deputy of the suspect, Ronnie C. Hatlan, age 44, possessing a firearm. 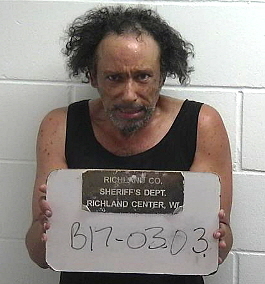 Hatlan who appeared to be extremely intoxicated told the deputy he had a firearm in his pocket. Dowling attempted to take the firearm away from Hatlan which led to a struggle between the two over the firearm. While Dowling and Hatlan were wrestling over the firearm, the deputy was able to deploy his TASER striking Hatlan in the back. The TASER immobilized Hatlan and he fell to the ground releasing the rifle. During the struggle over the gun it discharged into the air and no one was injured. Hatlan was subsequently arrested. During the arrest, it was determined that Hatlan did not have a firearm in his pants pocket and the only firearm involved was the .270 rifle. Hatlan sustained a laceration to the left side of his face. Hatlan was treated on scene by Ocooch Mountain EMS. There were no additional injuries sustained in this incident. Hatlan was taken into custody for disorderly conduct and endangering safety by intoxicated use of a dangerous weapon. Dowling has bond conditions through Grant County which prohibit him from consuming alcoholic beverages. Dowling was taken into custody for felony bail jumping. According to Crawford County Sheriff Dale McCullick, the Deputy who was the first on scene was Deputy Kyle Mezera. Sheriff McCullick stated that Deputy Mezera did an outstanding job and was able to take the suspect into custody without any serious injury. McCullick stated that Deputy Mezera, who was threatened by Hatlan would have been justified in using deadly force, instead Deputy Mezera who at first had his service pistol drawn, went to his less lethal TASER and affected the arrest. Assisting on scene was Ocooch Mountain EMS and the Boscobel K9 Unit. 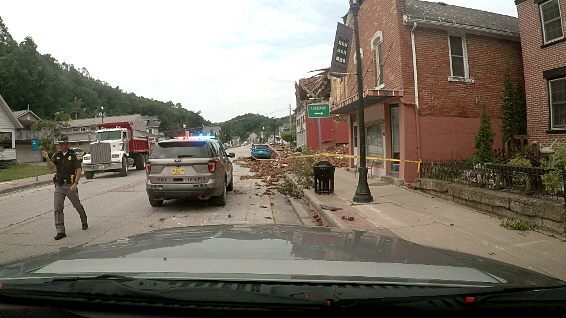 A video tour of storm damage along Main Street McGregor. July 20, 2017 - Major storm damage to area from last nights storm. 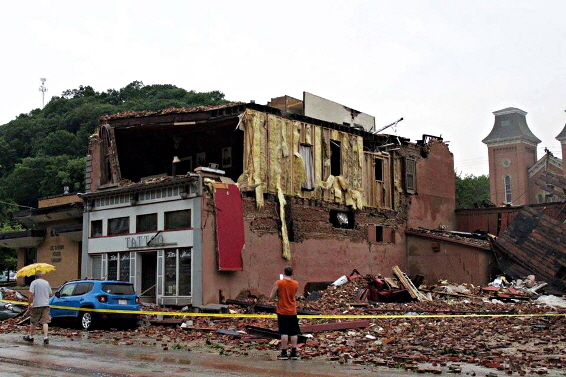 High winds caused extensive damage to downtown McGregor, Iowa. The Clayton County Sheriff’s Office released the following statement: All traffic going in and out of Mc Gregor is shut down until further notice due to extreme storm damage. If you do not live there, PLEASE don't go there. The Sheriff's Office is also currently without power and is unable to answer to answer administrative and emergency phone calls. If you have an emergency, dial 911 and you will be rerouted to Delaware County who will pass on your information to us. An additional statement was made this morning - A press conference will be held on Thursday at approximately 10am in the parking lot of Casino Queen in Marquette. At this time our primary concern is the safety of residents and first responders. 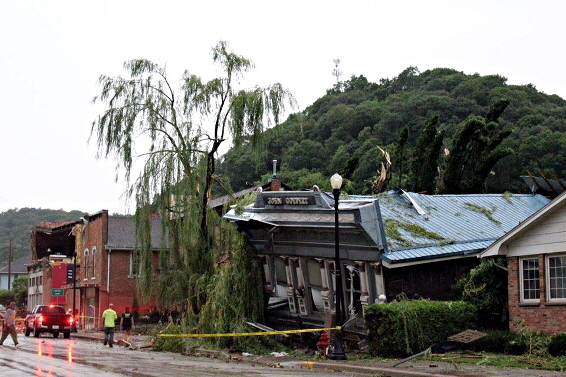 The City of McGregor sustained severe storm damage. We are not aware of any injuries at this time. We need to limit access to the City of McGregor. Only residents will be allowed access at this time. Law enforcement is blocking traffic at each access to McGregor. A shelter has been established at St. Mary's church in McGregor for McGregor residents. At this time we are not requesting any volunteers. Other areas with damage are Prairie du Chien, WI., Iowa County, WI reports: Trees down with power lines and standing water on roads county wide. Use extreme caution. Crews are out. In Allamakee County, IA: The Sheriff’s Office received a report of a barn that had blown down, trapping an individual under the barn. Dennis Deal, 67 of Waukon, was in the barn doing chores when the barn was blown over by high winds. Deal was pinned beneath the barn. Deal was located by first responders and was extricated from the building. Deal was transported by ambulance to Veterans Memorial Hospital in Waukon Iowa. Deal’s condition is unknown at this time. Cassville, WI - July 22, 2017 - Cassville was hit hard by flash flooding in the early hours of this morning. 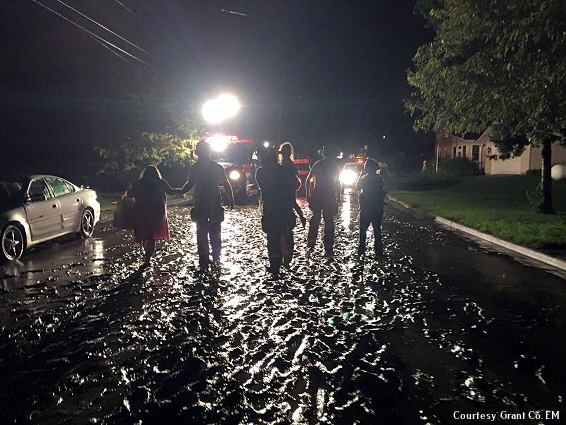 Residents who awoke around 2 a.m. were shocked to see mud and debris coursing down their streets, that’s before the lights went out.. Basements were flooded as mud and water floated trees and even cars down the street, leaving behind a foot or more of mud. See storm damage video. “Swiftwater technicians and firefighters rescued and evacuated a number of people in Cassville and rural Potosi due to last night's storms. We suspect that many homes in western and southern Grant County have flood damage, and we know a few have been destroyed. If you had significant damage to your home, please report it to the Grant County Emergency Management Office by calling 608-723-7171, emailing sbraun@co.grant.wi.gov or messaging us on Facebook. 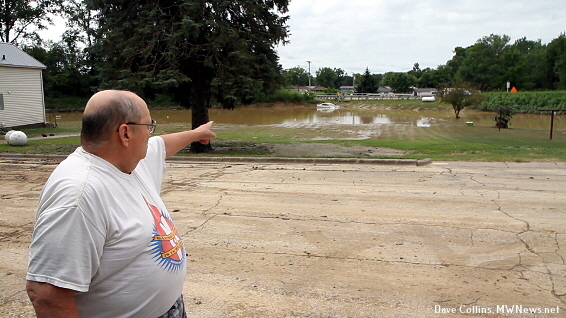 Update - July 22 at 7:04 p.m. - The Littleport Fire Department has advised Clayton County Dispatch that the Volga River flood water is going over the earthern levee. Public is to avoid the area, and also avoid the Volga area. 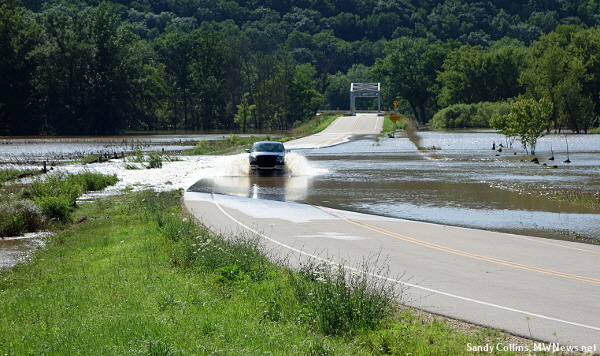 Clayton County, Iowa - July 22nd at 5 p.m. - In the overnight July 21st into July 22nd, 5-7 inches of rain fell over the Volga River Watershed. Volga City Fire was called out at 12am this morning. At 11am the City of Volga launched a partial evacuation of residents focusing on residents between Lafayette Street and the Volga River. We are closely monitoring the river levels here at Volga. Our primary concern is the safety of residents, and first responders. We have taken precautions to ensure their safety to the best of our abilities. At this time the power will remain off in portions of town that were evacuated. We have tried to minimize impact to residents that are not in the evacuation zone. While Hwy. 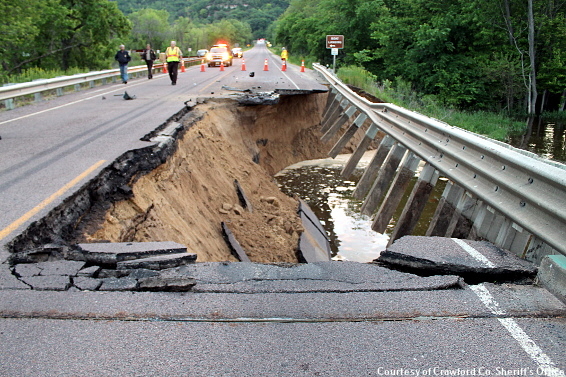 179/E remained closed west of Wauzeka on Sunday. The pictured truck came through, before turning around and driving back through the water. It must have seemed like a fun Sunday activity.